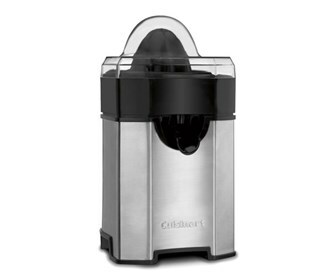 The Cuisinart CCJ-500FR is a sleek brushed stainless steel citrus juicer gets out more juice more efficiently. An adjustable auto-reversing reamer features custom pulp control settings, and the unique Final-Spin feature maximizes the amount of juice from each piece of fruit. Dishwasher-safe parts make cleanup a breeze. The Cuisinart Citrus Juicer has many exciting features for users of all types. You can extend the lifetime of your Cuisinart Citrus Juicer with the purchase of a FactoryOutletStore Factory Protection Plan. See the Cuisinart Citrus Juicer gallery images above for more product views.